Removing the seats, interior trim panels, carpet, insulation and the very heavy seat bracket has turned to van into an uncomfortably noisy ride. Conversations are difficult and it is certainly not a quiet environment for enjoying music. I intend to determine sources of noise, address them and finally attenuate any unavoidable noise coupling into the cabin. Listening carefully to the van as I accelerate, decelerate, cruise and coast at different speeds I have started to hear the difference in the types of noise the van is producing. These are primarily speed dependent and acceleration dependent noise. There is a constant drone that seems to increase in frequency with speed. It's probably the tires. There is also a lower frequency modulated drone which I imagine correlates in frequency with the rpm of the driveshaft. Possibly caused by worn u-joint bearings or an drive shaft gear worn to be eccentric. At around 50mph and again around 70mph there is what sounds like a resonance excited likely by the wheel vibrations. The wheel wells, side panels and/or floor might be the resonant members at these speeds. During accelerating there is a sound that pronounced. It is dependent on speed and how hard I am accelerating. I imagine this to be the meshing of potentially worn gears in the rear end. 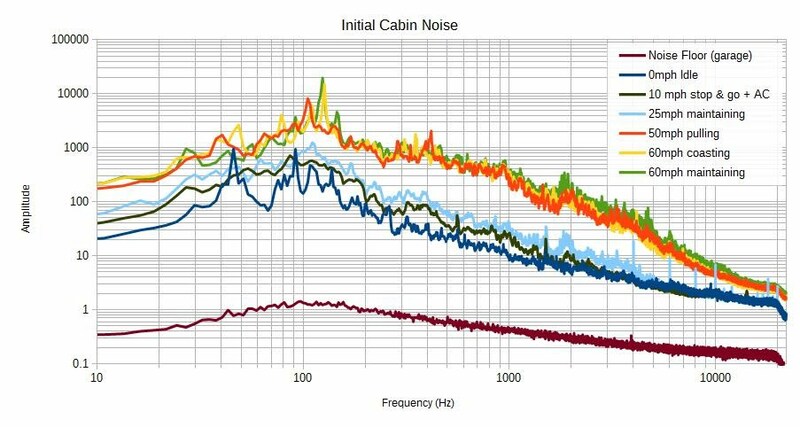 I want to have measurements of the cabin noise now and again after I do all the work to quantify any improvement. The external microphone and amplifier are not necessary, but I wanted to play around with them anyway so I made the purchase. I was curious if plugging the phone into its USB charger would affect the recorded sound. Indeed, some noise showed up when plugged in. This is with the phone's built in microphone, plugged into a KMV switch on my desk at work (4 more days until my sabbatical!) in a quiet-ish environment. People are periodically talking in the background, and there's traffic noise but their contribution was negligible due to a averaging the data over time. I don't have a way to do an absolute SPL measurement so everything will have to be relative. The spike around 700Hz is from my computer fan and the 60Hz I can't hear myself, but it's everything else in the office humming away on AC mains. The green line in the plot show that some slight bit more noise is picked up for some reason when I plug in the USB charger. This is enough to convince me to remember to not take measurements in the van when plugged into the USB charger. RPM dependent noise may couple from the alternator through the inverter to the charger and into my phone and add a mysterious phantom signal I won't be able to track down with my ears. Using the Berhringer/iRig/S4 (no charger) setup I measured the following data. I also taped the iRig's gain knob so that it will stay consistent through subsequent measurements if I'm careful. The noise floor was measured in a quite garage with the engine off. Idling, there is a peak around 45Hz (2500rpm) and some general engine rumble from 80 to 200Hz. At speed, noise dramatically increases in amplitude. A distinct peak appears at higher speeds and its frequency seems to track road speed. A 32" diameter tire travels 8 revolutions per second at 50mph....How many knobs around the circumference?...does that correlate?